There is really one simple formula for success: Pick a concept, idea or project – one that you feel strongly about and that you understand intimately. Then pour your whole self into it, unconditionally. That is exactly what we have done with Bianco’s. That is exactly why it works. That is exactly why we have loyal patrons and loyal staff. “Bianco”, meaning “White”, is what you get when you mix the appropriate intensities of the most vibrant of colours. 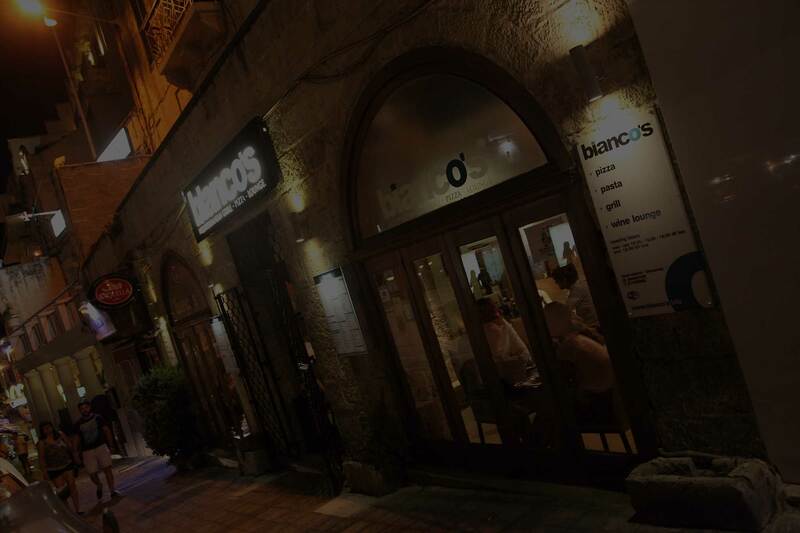 In much the same way, Bianco’s brings together our years of experience in hotel and restaurant management, and our passion for great food, wine, atmosphere and service. Bianco’s is variety and balance under all aspects. Visited this restaurant on our last night. The best restaurant we ate in. It was a lovely place with very welcoming staff who were most attentive at all times, pouring wine when required etc. The “something for everyone” idea is a concept that has been used and abused for decades as an excuse for mediocrity, sloppy service, unattractive backdrops and poor food. At Bianco’s, we are proud to have made this concept work as it should. We have created a place that brings together the very best off all aspects and catering for any occasion, be it a casual dinner, a family outing, a business lunch, a romantic evening, a chill out night with friends or a touch-and-go take-away meal. And since so many of our patrons feel the need to complete their dining experience with a delightful bottle of wine, we have created a wine list that reflects and complements both our menu and our patrons’ adventurous taste buds. Bianco’s can be a new experience with every visit. Open Monday to Sunday, midday till late, lunch and dinner offer completely different vibes. So do the different areas of our restaurant. Enjoy your meal in the main area, then retire to the sophisticated sofas in our stylish chill-out area for a bottle of wine from our extensive list. Or you may want to treat yourself and your friends to a special night out in our VIP area (10 persons max). And while you’re at it, why not give in to your inner child and indulge in a Bianco’s Sweet Platter consisting of crepes, nutella, mixed nuts and fresh fruit? Whatever your fancy, whatever your mood, we can make it work. Great food and wine are the “easy” part. And all it takes to build a pretty place is money (albeit quite a bit of it). But earning the trust and loyalty of a good team is a feat few can boast. At Bianco’s, our team has grown into a strong, tight family driven by loyalty and a sense of belonging. It is the main thing that makes us stand out. Time and time again, the same persons will come to your table and attend to you with the same smile and warm-hearted amiability. They are proud of their work and we are proud of them. They make all the difference. The formula for our success is simple: We have poured all of ourselves into the concept that is Bianco’s. That is exactly why it works.